Rose skips around the yard holding a purple balloon. She is so joyous, so utterly in love with her balloon, you can almost imagine all the neighbors dropping their lawnmowers and cupping their ears to the music piped from the broccoli patch to which her dance is choreographed. Then krrrrreeee, the needle skips on the soundtrack, the balloon accidentally slips out of her hands and everything goes quiet. Cody, who lives next door and is somehow always in his backyard grilling meat with a posse of friends and dogs, sees the purple balloon float into his yard. He runs after it, down to the end of the block and then we lose sight of him. Twenty minutes later Rose says, “Cody must be down at my school by now.” I picture Cody traveling the 10 blocks to Rose’s preschool, sprinting, arms outstretched towards the balloon – always just out of reach. “It’s been awhile, he may have given up,” I tell Rose. “Or he might not have,” she replies. Rose planting kale seeds in Elton John-approved outfit. People who read my writing sometimes think we live in the country. The truth is that we live on a 1/8 acre plot in town (in a duplex – there’s 8 of us on the property). I once got enviously fixated on this photo of a girl riding a wooden swing draped over a thick oak branch. In the background was the fuzzy green of fields and forests forever. Our background is Cody and his posse of 3-legged and shirt-wearing dogs, which is actually great, even though he never did catch that balloon. Our parenting (and everything else) takes place in a public realm. Watering a patch of potatoes recently, I heard Dan say from our open window upstairs, “Col, when you need to go poop, you’ve just got to go,” which now is neighborhood information. I actually love the urban-ness of it. I love the roving band of neighborhood children who try to corrupt Col and Rose with video games and red dye #40. I love how you can hear our hens from the church at the end of the street brrraaaaccccccck. I love how Col and Rose call through 3 backyards of fences down to our neighbor Frankie (who Rose used to call “Crankie”) to ask if they jump on his trampoline. Just to the right of potatoes is a Toyota camper top, for free! YOU CAN HAVE IT! Also, can anyone tell me anything about hilling up potatoes? :: Because the chicken run is small and the girls have devoured everything formerly alive within, we’ve been hiring Col and Rose to babysit the chickens in the yard. They get a dollar for every hour they usher the chickens around the yard, showing them to the alfalfa/dandelion/mallow buffet while keeping them out of the garden. Speaking of chickens,we had about 3, 000 too many pill bugs in our greenhouse (and it is not true that they only eat dead and rotting vegetation, just ask the tender bean plants), so we brought 2 hens into the greenhouse for a live protein snack. Also, Dan and I tossed around the idea of buying a leaf shredder to speed up decomposition in the compost, but then realized, after putting several bags of dried leaves in the chicken coop last fall, that the chickens are our leaf shredders. 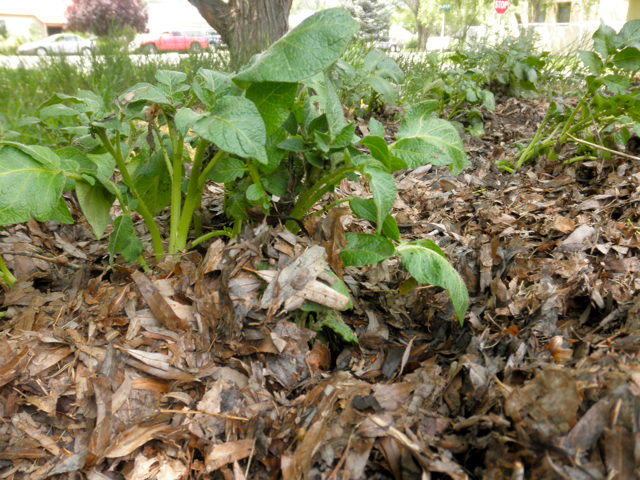 This is my new garden mulch: shredded leaves and straw mixed with chicken poop! :: The honeybees are gone. Sage, (who lived downstairs for a few years) took them to his new house, which was sad but also, if you remember my gargantuan stung foot and resultant epi-pen, a relief. 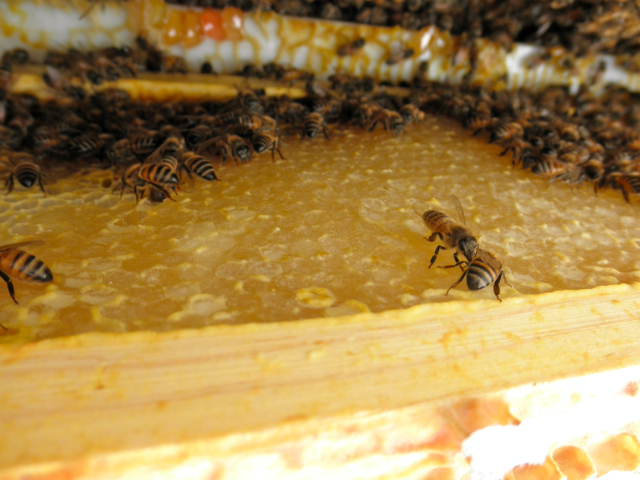 Someday we’ll get another hive and put it on top of our chicken coop, so my foot is not in their flight path. :: Hey, psst, do you want to see my compost? 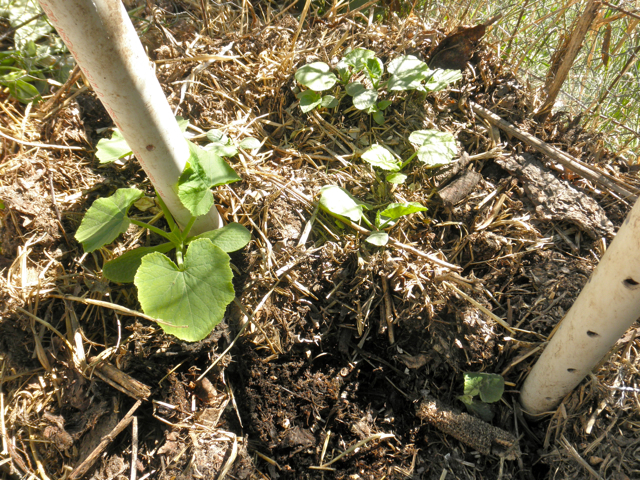 More proof that compost is magical: here are the volunteer squash that came up in my compost, unwatered, unprotected from that frost, and bigger than any of the babies I’ve started in the greenhouse. :: Strawberries are coming on. For every 10 strawberries the kids pick, I get one palm-smushed, hot strawberry brought to me, which is exactly what I hoped for when we planted these strawberry plants last year. :: While the tomatoes-peppers-squash grow turtle-slow (it’s still 40F at night! ), the toothy greens are exploding! :: Behold, the root cellar. Even as I see it, I can’t quite believe what Dan has done here. 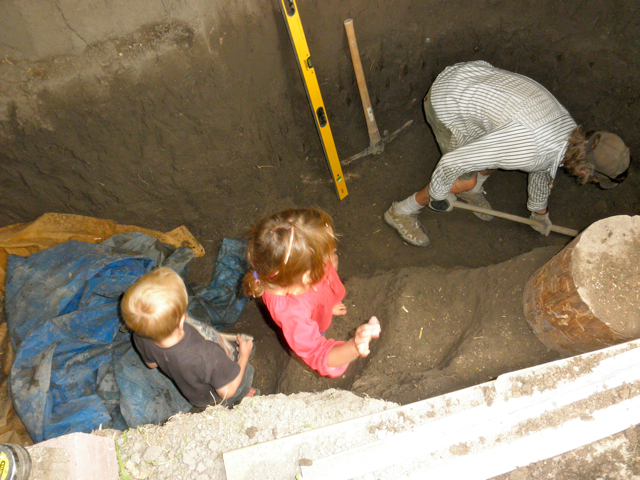 Namely, the man has dug a 6 ft x 6ft x 6ft hole in solid clay. Hello, granite arms! Hello, aphrodisiac! I think Col’s now contemplating a mining career, y’know, the kind where they use antlers for digging. He’s always in there with Dan, discovering earthworms (5 feet down!) and recently an asteroid belt of small rocks embedded in the clay. Without even a roof, the pit is already 30F cooler than the outside air, humidity is at 85% – going down there is like a spa treatment for us dwellers of the arid Southwest. 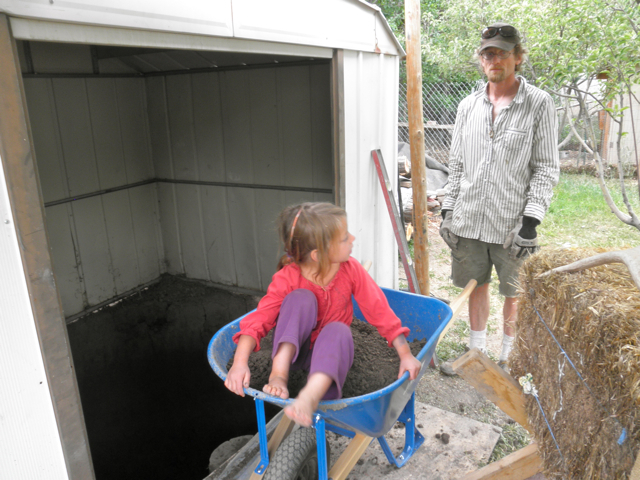 “This is getting me in great shape for elk season,” Dan says after his 100th wheelbarrow load (with child aboard). 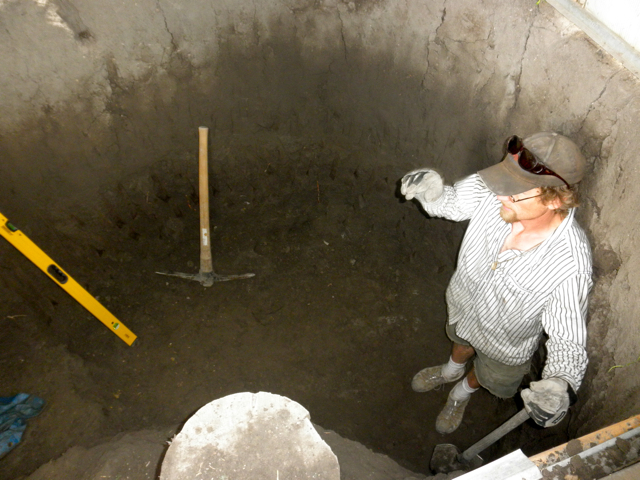 Note: now that Dan is in 6 feet deep, each shovel load of dirt has to be swung up over his head to the wheelbarrow. 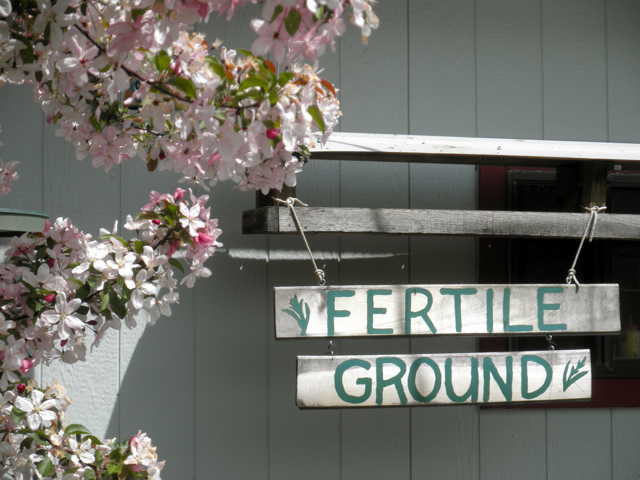 Happy 14 years, little urban homestead! oh, ps: have you seen the before pictures of the homestead? As my friend Sue said, “I can’t believe you guys bought that place.” And last year’s tribute to the homestead. 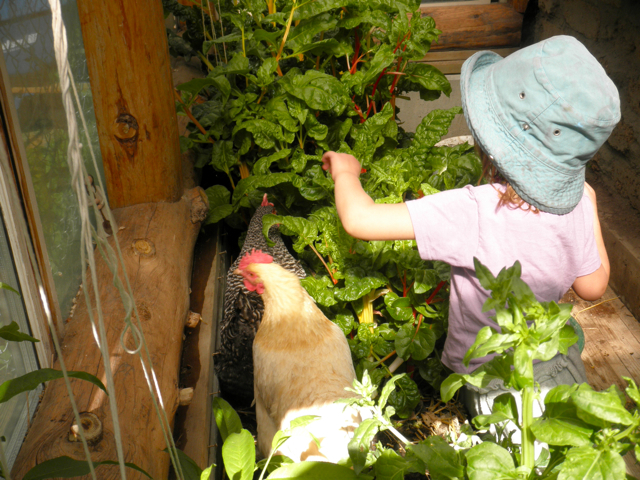 I had no idea you were an urban homesteader too! I’d love to hear about how you do your compost. I want to but I don’t want to piss our neighbors off by attracting raccoons or something. 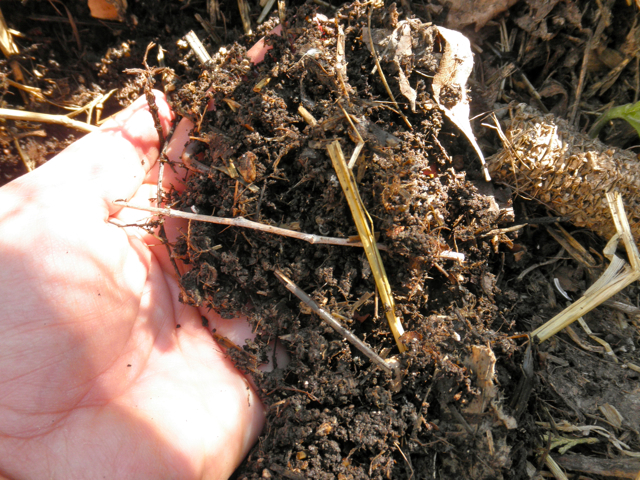 Hilary, The hope is that you can *train* your neighbors to dump their grass clippings, etc… in your compost bin. 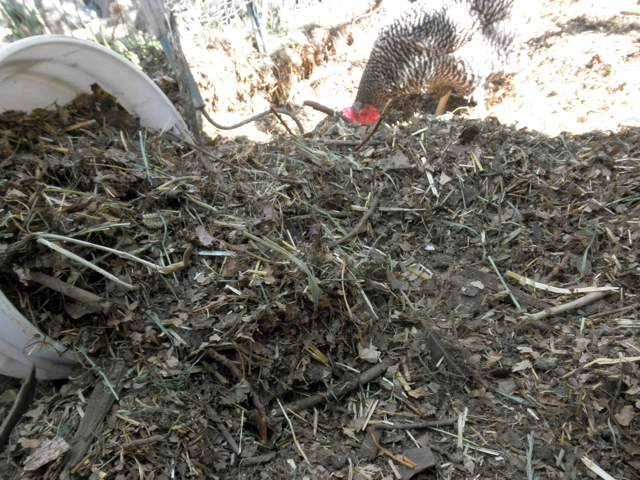 Our compost pile is omnivorous, meaning everything goes in: dairy, meat, an occasional dead bird…we keep it watered in the summer and when we throw in a bucket of kitchen scraps we put some straw or dry leaves on top to neutralize the smell and provide the right balance. To keep out pests, you could try putting some chicken wire over the top of your pile. I haven’t been reading long, but yes, thought you were more in the country and with more space. I have more space than I realize—just need to figure out how to use it best. Shade is my biggest challenge right now (that and getting up the courage/motivation/whatever to actually get chickens and/or bees. Will all the other chickens and the few other beekeepers in my neighborhood, I suppose the fox under our barn and the bears that roam the yard regularly aren\’t really a good excuse). 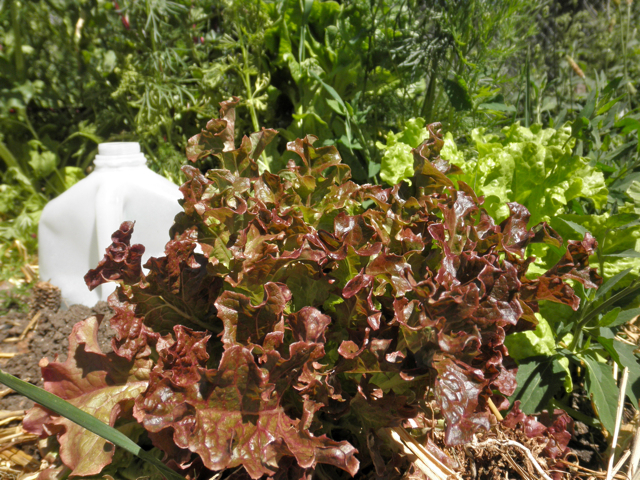 Shade can be good for lettuce, kale, spinach and other greens once the heat of summer kicks in. I had the same problem with pillbugs (and earwigs). They are NOT just decomposers. My bees are gone too, but because they swarmed and I missed it (intended to split the hive to prevent this, but didn’t get to it in time). But I harvested almost a gallon of honey from the left overs. Love your urban life. My rural life north of Spokane consisted of neighbors who grew pot for a living in a large greenhouse (but didn’t grow a garden) and had about 9 dogs between the extended family, who all barked all night long, and one who bit your ankles while you stood at their front door talking. Sometimes rural is not all its cracked up to be. I now have great neighbors on both sides less than 100 ft away. And my nights are quiet! Glad I got a chance to live here for a short time, and potluck, process meat, etc. So much fun to follow your posts and watch growth happen! I mean, I already knew Dan was a badass, but achieving those boyhood dreams of digging a Pacer-sized hole is really something to love in a man. It’s such a cheesy line to say, but I mean it in all honesty when I say, “I just love what you’ve done with the place.” There’s so much beauty and life in that wonderful and small piece of property, it’s really a testament to the great sorts of folks you are. 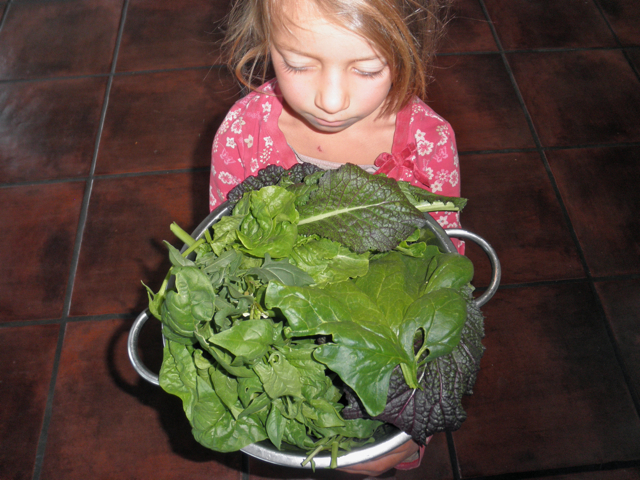 Makes sense to me that you like the urban homestead; it’s a good fusion thing. And Californians love fusion (as I read charts, call a patient, read your post, etc. I like fusion, too). Happy anniversary! Rosie’s joie de vivre and optimism is delightful and contagious. 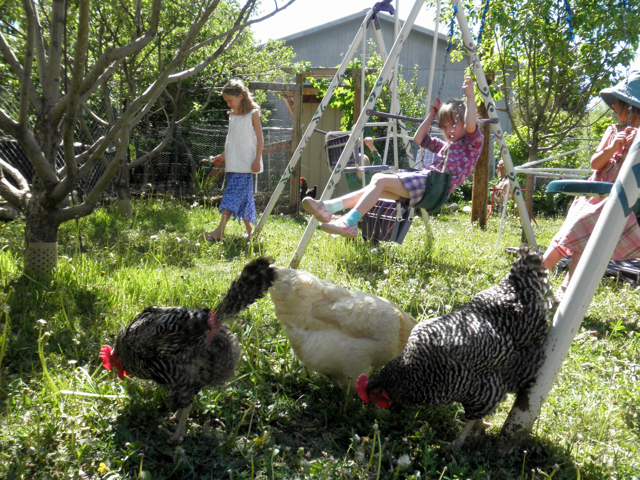 What a wonderful life for kids — and chickens too, i’d imagine. I’m with Ed – it was great sharing the space with you for a bit. We sure had some good times there on San Juan Drive! Whenever I see pictures of the backyard I think of Bro the cat. Rest in peace big guy! 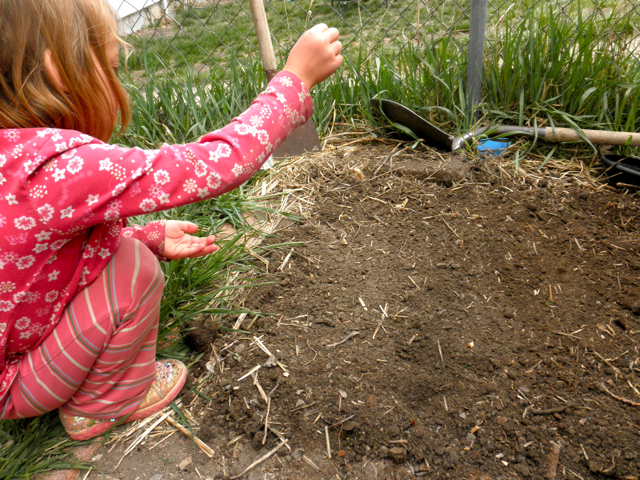 David – I was just mentioning to Dan how the soil in one of our newer garden beds is really improving. “It’s all the decomposing cats,” he said. Cheers to Bro the cat and his good soil juju! I hope soon I'll be following in your footsteps! rolling on the floor laughing that you compared your garden beds to the unitarian church! yes, everyone welcome, the more the merrier. and i just have to say, y’all are rockin’ that 1/8 acre! I always forget how little you’re working with in terms of space over there. You do more with your little piece of earth than many do with acres! 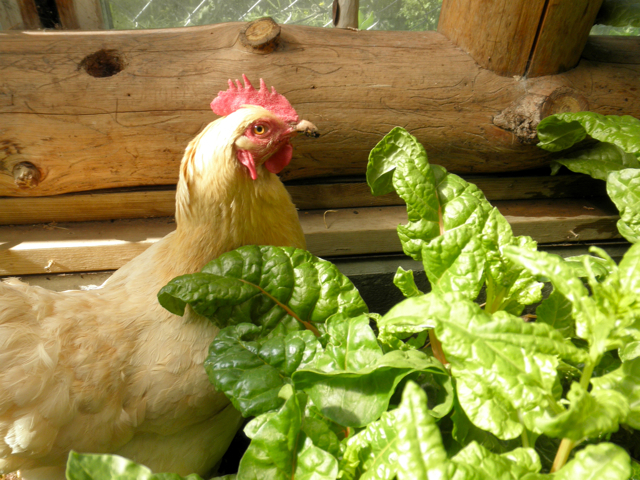 Happy birthday to your urban homestead! Loved this and also the before and after pictures on your old post…I knew you were urbanish, but always assumed it was on one of those cute little Victorian house/ VW bus streets. Well done! Whatever you learn from the potatoes, I hope you’ll pass it on to us. I’m getting up the gumption to try potatoes next year. Do you have deer? It’d be a dream if I could find a decent crop to put in my non-deer-proofed areas. So far it’s pumpkins. They even eat the tomato plants. Good thing they’re so heartbreakingly sweet. We do have deer. Lots of them. We built a 6 foot fence around our property years ago after a tomato debacle that I could never repeat. Still learning about potatoes, will continue to share. I wish ever to be your neighbor, my little house being just down the street, one of those old Victorians (that was only built for practical, not aesthetic, by our great-great grandfather). I could have a garden up here in MI, and should. Maybe next year I’ll find the fortitude to create something edible. Or maybe next year I will be your Durango neighbor, if only wishes would come true. Whoa-that’s a long time. I remember when you planted fruit trees. I said, how long till they produce fruit? You said 3-5 years. I said-how do you even know you will be here in 3 years? Ahhh, how the roots have set. I have lived in 7 different houses in 4 different states in the same time span. My roots are set in the wind. My husband tills next to the potatoes so that he has some extra dirt and then uses it to hill the potatoes. You can also use hay/straw. He lets it grow 6-8inches and then hills them so only 1 inch or so is showing. When they grow again, he hills them again. Had no idea you were in D. Spent a week there a few years back and loved the town. To us, Portland is a small town (!) and we hope to get there someday. Happy birthday to the homestead! I must say that I had no idea that your home is a duplex. 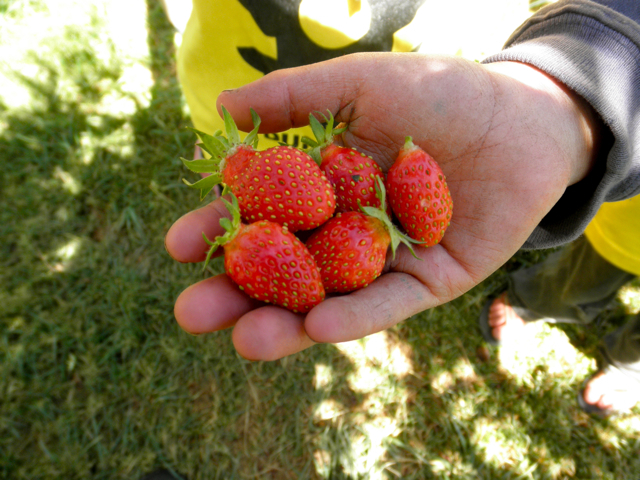 Oh, and the strawberries look delicious!